This client had a skin graft to the left hand side of her upper lip following surgery for skin cancer, even though the skin graft was an exceptional result the loss of approximately 1/3 of the upper lip body and vermillion line was very noticeable and this emphasised the visibility of the graft. 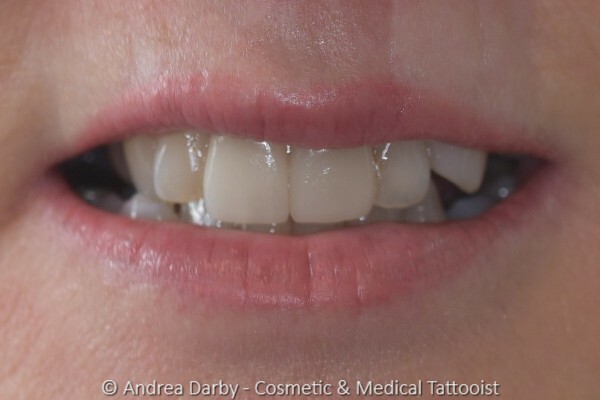 The client requested lip tattooing to restore natural shape, appearance and colour to the lip body and vermillion line. Comments: This client had a preference for a subtle enhancement, the after photo above shows the lips 5 weeks after healing from the first procedure and the large pop-up image shows the lips immediately after the second procedure with pigment still visible in the epidermis reflecting light giving a slightly chalky appearance prior to healing (see the healed photo above after first procedure for a healed comparison). 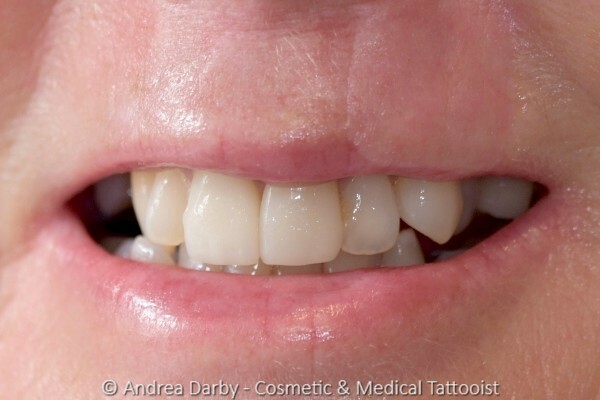 You will notice that the lip tattooing almost completely deemphasises the visibility of the graft in the white lip above due to normalising the lip shape and restoring the lip body and vermillion line. NB. When tattooing grafts and or in instances where clients have previously had skin cancers it is extremely important to select pigment lines that are allergy tested by manufacturers whom are very restrictive in their use of colourant ingredients to minimise the risk of skin reactions. 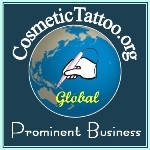 Training is the most important investment that a cosmetic tattoo technician can make for the future of their career, it often puzzles me why anyone would think that they can offer services to members of the public for hundreds of dollars without spending an adequate amount of money on their own training in the first instance, the more training and experience the better. My training is based upon the core principles of ethics and best practice together with a genuine desire to assist students with their education with reliable well researched information, click here for further information on training. "It is very encouraging to see this type of positive result for patients from cosmetic tattooing after completion of plastic and reconstructive surgery. Exceptional job keep up the good work. " "I really want to learn medical tattooing from you as I think you are the best in your field is there any chance that you would consider taking on an apprentice who has traditional tattooing experience? If this is something that you might consider I would be happy to work for you as an intern/apprentice for 6-12 months for no pay as it would be an incredible opportunity to learn from the best. My contact details are in my account profile, many thanks for considering me. "A very nice outcome for your client she must be very happy with this."